Picking font pairings can prove to be incredibly difficult, particularly if you’re not a top-notch designer. Even now, many of us developer types just pick some fonts and jam them together. There are a few different sites and blogs around for finding acceptable fonts to slap next to each other, but there’s got to be a better way. 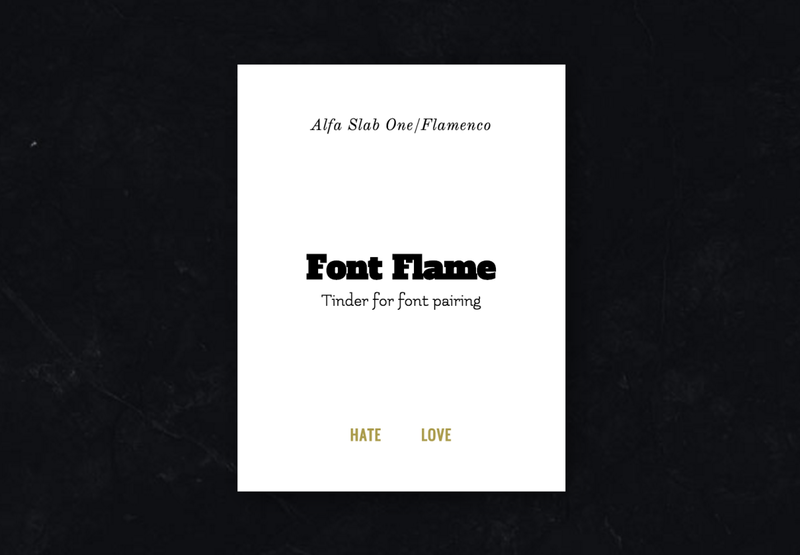 Font Flame might just be that alternative, with a Tinder-like interface for picking your next font duo. It sources the typographic suggestions from Google Fonts’ free library and shows them with a simple ‘hate’ or ‘love’ for quick-fire judging based on looks. Each ‘love’ is saved for later and if you’re like me, you’ll end up clicking through fonts for far too long. Right now it’s randomly generated, but the developer is looking to build a curated version too.